The National Institute of Information and Communications Technology (NICT) generated a real-time signal of an accurate time scale by combining an optical lattice clock and a hydrogen maser. The signal generated in this optical-microwave hybrid system continued for half a year without interruption. The resultant "one-second" was more accurate than that of Coordinated Universal Time (UTC) on that date, and the time deviated by 0.8 ns in half a year relative to TT(BIPM), where TT(BIPM) is the most accurate time scale post-processed by the International Bureau of Weights and Measures(BIPM). This demonstration proves the capability to keep time with respect to the future optical definition of the second, which may be realized in next ten years. This achievement was published in an open-access journal Scientific Reports, on March 9, 2018. National standard times are maintained to be synchronized to UTC. Since the cesium hyperfine transition defines the length of the "one-second", maintaining accurate Cs clocks is straightforward to keep time. Optical clocks, on the other hand, made rapid progress recently and reached much less systematic uncertainty than that of microwave standards. Nevertheless, nobody has so far generated a real-time signal of a time scale using optical clocks because it is still difficult to operate an optical clock continuously for one month or longer. Researchers in NICT Space-Time Standards Laboratory including atomic physicists and time-composing experts, demonstrated a novel time scale generation, "optical-microwave hybrid time scale", which combines an optical lattice clock with a hydrogen maser (HM). The Strontium-87 lattice clock is sparsely operated for three hours once a week. This operation calibrates the frequency of the HM, and furthermore the measurements in the latest 25 days allow them to predict how the HM ticking rate will change. Then, they can in advance set the adjustment of HM frequency in the following week to compensate the predicted frequency drift. The resultant time scale was compared with two so-called "paper clocks", UTC and TT(BIPM). UTC is often monitored by the state-of-the-art Cs fountain frequency standards which are operated by national metrology institutes, and the result of the monitoring is reported to BIPM. Once a year in January, BIPM incorporates the result of these calibrations and further makes corrections to past UTC. This is TT(BIPM) and is the most accurate "paper clock". As shown in Fig. 2, the time difference of the optical time scale against UTC expanded to 8 ns in five months, but that against TT(BIPM) remained in less than 1 ns. These results indicate that the optical time scale is more accurate than UTC and is at least comparable to TT(BIPM) in terms of accuracy and stability. UTC and TT(BIPM) are numerical products computed in deferred time by the cooperation of more than 400 atomic clocks and state-of-the-art Cs fountains all over the world. On the other hand, the signal generated in NICT is a real signal which indeed ticked every second during the six months. "We serve the society by providing time endlessly without interruptions. The optical-microwave hybrid method demonstrated here brings the benefit of optical frequency standards to time keeping." Tetsuya Ido, director of NICT Space-Time Standards Laboratory said. Another thing to note is the impact on the future redefinition of the SI second, toward which the community of time and frequency metrology has recently started the discussion. The hybrid method succeeded in evaluating the one-month mean frequency of UTC for all six months, and the results were consistent with other evaluations reported from the state-of-the-art Cs fountains. The capability of calibrating UTC on the basis of optical clocks is one of the prerequisites for the future redefinition. NICT generates Japan Standard Time (JST). NICT aims to apply this hybrid method to the JST generation system step by step. The next step would be establishing a redundancy of optical frequency references. 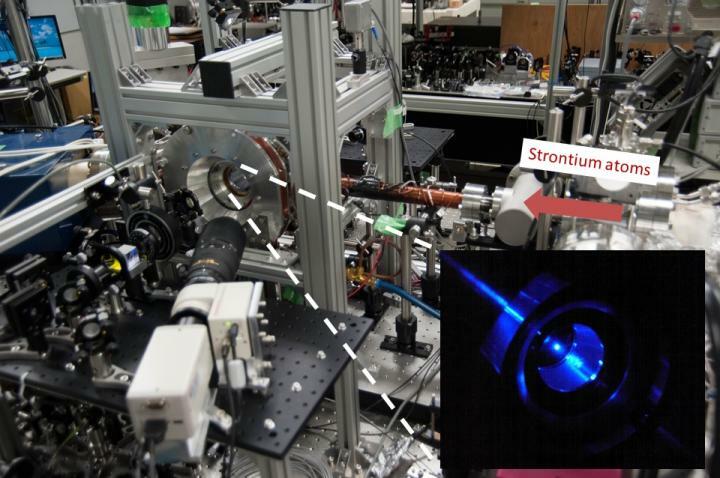 Another optical lattice clock or single-ion clocks will work. They may utilize those in other laboratories by connecting to them by an optical fiber network or satellite-based frequency transfer. Tetsuya says, "Highly precise optical clocks are expected to be geodetic sensors to detect the variation of gravitational environment. Such applications demand a reference that remains unchanged. Highly accurate and stable national time scale may play this role that is available in 24h/7d as an infrastructure."